Peer to peer, ride sharing app for Chennai. Ola for 2 wheelers. Intelligent investment recommendation app for tax payers. Online marketplace for lawyers, consumers and virtual law firm. We've worked with businesses in more than 8 industries to fulfill their critical digitization goals. "Codewave was very dependable and fully committed to the success of the project. Their 'can-do' attitude and excellent communication made our work together a very positive experience"
We've done experiments and built prototypes on trending technologies, few of them include Chatbots, Drones, Wearables, OCR (Optical Character Recognition), Image Recognition, Mesh Network (Near Field Communication), Blockchain and the latest being UPI that enables P2P payments. We’ve enabled businesses across many industries visualize new digitization opportunities and scale up with tech. 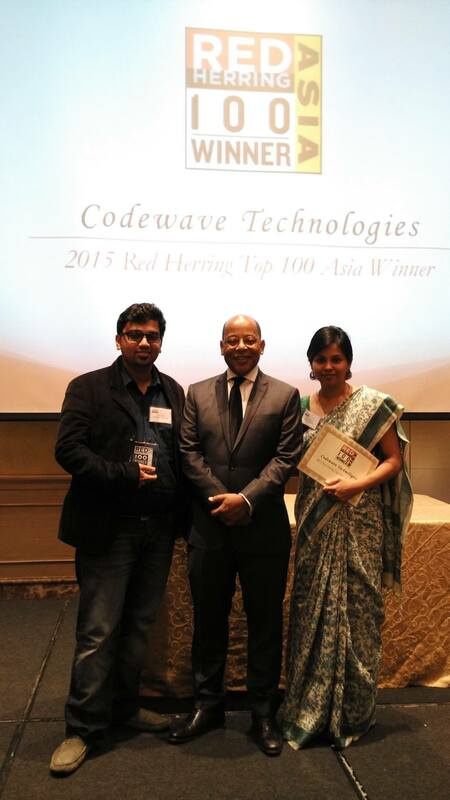 Codewave was founded in May 2013 with a vision to help businesses with their digitization goals. The team has grown organically from 4 to 45 and has seen high engagement, with a people first approach. Codewave is one of the first companies to make growth a daily affair with peer to peer feedback, eliminating annual performance reviews. We’re proud to be a Peerly Workplace, thriving on transparency, empathy and peer comfort. Peerly is not just for us, but also open for companies across the globe who love this spirit. We have a reception area, but no receptionists. We have no cubicles, no walls between tables. We feel money is just a by-product of a business headed right. Codewave Leadership Cafe’​, is an event organized every week to have people come forward and speak, share perspectives, insights and inspiration from their lives. This started one friday, as a casual event, where we had few team members come forward, talk about a ‘cause’ they felt deeply for, with a personal story and how they hoped to bring change. We decided to make this a platform for people to communicate their ideas - fearlessly, constructively and impactfully. We also once had a guest, Mrs Ratna Mary, our tea vendor speak about her thriving 21 year business, the journey from serving 5 cups of tea to 500 cups a day. Skills that define a career, ambition to grow with technology.. I asked a 105 year old woman showing my phone..
Only humans can connect, understand and capture the emotions..
Quick end of the year recap of some incredible moments of celebrating people, work and our way of giving back. Amrutha, android developer at Codewave talks about the Codewave Leadership Cafe' and her experience hosting it. Darshan talks about his experience at Codewave, his fast tracked growth from being an intern to a lead delivery manager. Red Herring announced its Top 100 award in recognition of the leading private companies from Asia, celebrating these startups’ innovations and technologies across their respective industries. Red Herring’s Top 100 Asia list has become a mark of distinction for identifying promising new companies and entrepreneurs. Red Herring editors were among the first to recognize that companies such as Google, Facebook, Kakao, Twitter, Rakuten, Salesforce.com, Xiaomi and YouTube would change the way we live and work. Red Herring’s editorial staff evaluated the companies on both quantitative and qualitative criteria, such as financial performance, technology innovation, management quality, strategy, and market penetration. This assessment of potential is complemented by a review of the track record and standing of startups relative to their peers, allowing Red Herring to see past the “buzz” and make the list a valuable instrument of discovery and advocacy for the most promising new business models in Asia. Red Herring is a global media company, which unites the world’s best high technology innovators, venture investors and business decision makers in a variety of forums, including print, online and exclusive events worldwide. Red Herring provides an insider’s view and access to the global innovation economy, identifying new and innovative technology companies and entrepreneurs.